Mango lassis are a great treat all on their own, but combined with homemade coconut yogurt, turmeric and probiotics they become even better. Probiotics help with your gut bacteria, while the good fats from the coconut help to unleash turmeric’s amazing anti-inflammatory abilities. Put it altogether and you have a recipe for great skin and a delicious treat. Coconuts are one of the most versatile and beautifying ingredients found in nature. They taste amazing on their own, work wonderfully for skincare and serve as an excellent substitution for dairy products like milk and yogurt. When you make coconut yogurt, not only do you get all the beneficial healthy fats and immune boosting properties of the coconut, you also get a healthy dose of probiotics. It’s the ultimate beauty food inside and out. Coconut yogurt can be used as a base in a wide variety of recipes — like the mango lassi featured below. A lassi is a traditional Indian yogurt-based beverage made with water, spices and fruit. This recipe is close to the classic version except for the substitution of fresh coconut yogurt and optional sweetener. The flavor of this drink is exotic and intoxicating — have it for breakfast to start on a bright note! For the coconut yogurt, blend coconut meat until smooth. Stir in probiotic powder. Place in a covered bowl in a dehydrator at 100 degrees for 8–10 hours, or ferment at room temperature for up to 12 hours. The yogurt needs to be in a warm place with good airflow.Depending on the quality and strength of your chosen probiotic, the fermentation time may vary. Look for a creamy, tangy flavor. Once fermented, stir well. Coconut yogurt lasts in the refrigerator for up to one week. 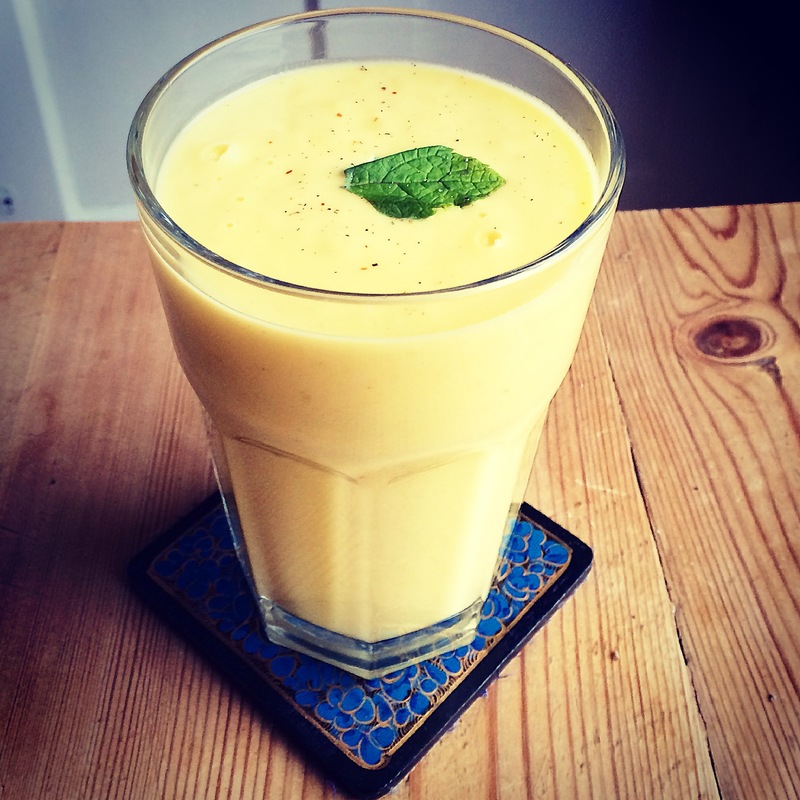 For the mango lassi, combine all ingredients in a blender until smooth and creamy.